In our laboratory at Graduate School of Human and Environmental Studies, Kyoto University, we offer courses and make researches in the field of geographic information science and technology. We also study about application of the technology in the fields of archaeology and historical geography to restore historical landscapes. Geographic information science is a new discipline that treats processing, displaying and analyzing spatial data on physical and human phenomena including geomorphology, hydrologic system, land use, population, economic activities etc. 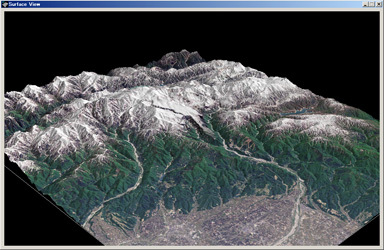 Computer systems built for such purposes are called geographic information systems (GIS). Instead of purchasing expensive GIS software, we perform research and education through creating software for geographical data processing by ourselves. To date we provide mapRaster2 for processing grid-arrayed (raster) data such as digital elevation models (DEM), and imageRaster for processing remotely sensed data supplied by earth observation satellites such as LANDSAT. In our seminars we offer education, not only by using these software, but also by providing students with programming skills for processing geographical data by themselves using programming languages such as C++ so that they display the results using mapRaster2. We also study about application of geographic information technology to archaeology and historical geography. I'm specifically interested in restoration of historical landscapes using aerial photography and satellite imagery. My recent subject of study is the historical development of city planning systems in East Asia and the Silk Road region. 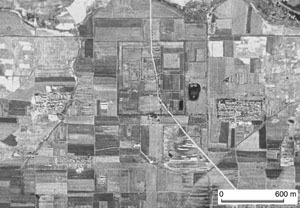 Satellite imagery of higher resolution, which became available recently, may be of great use for this research field. I aim ultimately to organize our findings with archaeological evidences and historical records into computerized geographic information systems (GIS). 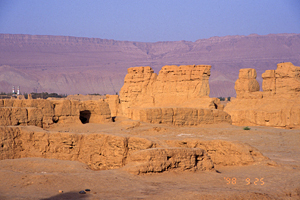 We make researches for restoring historical landscapes of settlements along the Silk Road. In these researches, we utilize satellite imagery for identifying remains of city walls and irrigation canals. In the webpages below, we offer the records (mainly photographs) of our field trips in the region supported by academic bodies. We make researches on the location and plan of the port towns built by the ancient Phoenician and Punic people using satellite images. 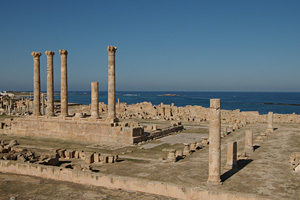 Ancient Phoenician people, originally from modern Lebanon, established trade relations among coastal areas of the Mediterranean Sea, and built many colonies along the north coast of Africa such as Carthage. The research project is headed by Professor Takura Izumi of the Graduate School of Letters, Kyoto University. 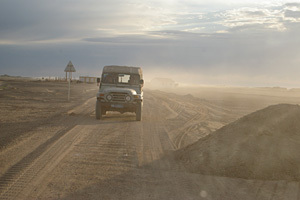 In the webpage below, we offer the records (mainly photographs) taken during our research trip. 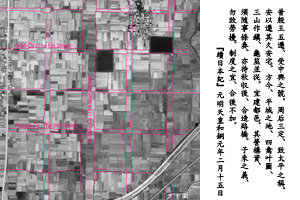 Noboru Ogata (2000) A Study of the City Planning System of the Ancient Bo-hai State Using Satellite Photos, Jinbun Chiri, Vol. 52, No. 2, pp.129 - 148, (Summary). The Bohai State was a kingdom which existed from the 8th to 10th century in the northeastern part of today's China. It shared many cultural elements such as Buddhism and Chinese writing system with East Asian countries including Korea and Japan. City planning system is another shared element, and I utilized satellite photographs to examine city plans of the capitals of the Bohai State. Xuanzang, a Chinese Buddhist priest in the 7th century, made a pilgrimage to India via the Silk Road from 629 to 645 and brought back a vast quantity of scriptures. Being not only a great man of religion but also an excellent explorer, he wrote "The Buddhist Records of the Western World," which provides us with valuable records of the geography of the Silk Road and India of the time. As a member of the Research Group on the Travel of Xuanzang, I reviewed his footsteps using satellite images. The following pages present my records and photos taken during the research trip made by the group. Kyoto was located as the capital of Japan in 794, and constructed based on carefully worked out city planning. Landscape elements of all ages are familiar to citizens and visitors of Kyoto until today. Historic monuments of ancient Kyoto were listed as the World Heritage of UNESCO in 1994. This website is created and maintained by the present and former members of the Laboratory of Studies of Region, Space and Environment, Graduate School of Human and Environmental Studies, Kyoto University. We aim detailed description of everyday life of people based on the primary sources. Resources on history and geography of the Nara Region, 35 kilometers south of Kyoto. This website was started as a project at Nara Women’s University. Historical monuments of Nara were inscribed on the World Heritage List of UNESCO in 1998.